The 23" KLV-S23A10 LCD TV is Sony's latest offering in its high-end Wega line of displays. Sony, a dominant player in both the LCD and plasma markets, has begun a complete withdrawal from plasma manufacturing and is focusing its efforts entirely on LCD Televisions - both LCD rear projection and LCD flat panel. Sony should have no problem staying at the top of the pack of LCD manufacturers if it continues to deliver TVs like the KLV-S23A10. The Sony logo is a hallmark of stylish industrial design and the KLV-S23A10 wears it with pride. WalkMans, HandyCam camcorders, MiniDisc players, and Vaio computers are a handful of Sony's enviable consumer electronics lines that other manufactures have long sought to emulate. The KLV-S23A10 builds on the respected Wega TV line. Sony clearly incorporates its knowledge from manufacturing consumer electronics, LCD computer monitors, and professional video equipment when building LCD TVs, devices that lie at the technological intersection of the aforementioned products. The KLV-S23A10 replaces the Sony KLV-23HR2 as Sony's 2nd generation 23" LCD TV. It is a 1st tier, solid and well-thought-out product, stylishly clad in silver, with cleanly-integrated bottom mount speakers. In terms of industrial design the Wega line stands out above its nearest competition, the high-end Aquos series from Sharp. In terms of picture reproduction though Sharp's Aquos line, with its ever-so-slightly less attractive casings, captures top honors. For consumers looking for an exceptional, mid-sized LCD TV, the Sony KLV-S23A10 is an attractive option that gets bonus points for its aesthetic appeal. Those people looking to use the LCD TV as a computer monitor on a busy desk will enjoy the display's VGA inputs, tilt-and-swivel base, and rock solid design. 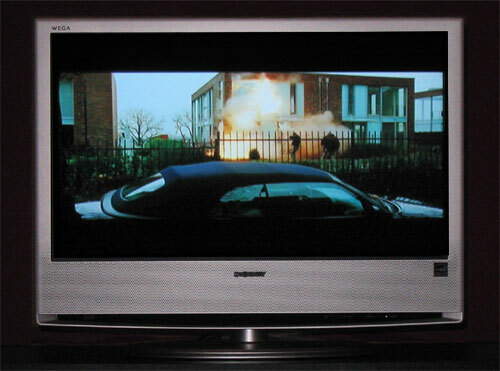 The Sony KLV-S23A10 LCD TV shines where most LCD TVs shine: during bright scenes. Color reproduction is overall exceptionally accurate. LCD artifacts are minimal and don't distract from the picture. The TV's weakness, which it shares with all televisions made from LCD technology, is that its performance degrades during dark scenes. Though not plasma-like, black levels are at the top end of LCD televisions in performance. The display comes with 3 preset color settings that are accessible from the picture button on the remote control: vivid, standard, and pro. Purists will appreciate the color accuracy and better black levels in everything from skin-tones to trees while using pro mode. When dark scenes come along and disappointment with washed out blacks sets in, even videophiles will be tempted to switch to standard mode, which delivers somewhat lighter blacks while allowing for more dark matter definition and slightly more perky hues. The vivid mode, which is the factory default setting, should generally be avoided. The vivid setting on the Sony KLV-S23A10 LCD television injects ridiculous amounts of color into the image, to the point where we thought that if testing with a black and white video we might been able see rosy cheeks and blue rain. The neon-pink lips and flaming red hair we saw in an afternoon soap-opera made the characters' melodrama all the more ridiculous. Staying in standard or pro modes, users will not have much need to adjust the individual brightness, picture (Sony's word for contrast) color, hue, sharpness or temperature. Even at its warmest temperature setting, which varies from cool to neutral to warm, the Sony KLV-S23A10 displays realistic skin tones. Watching our test DVD, The Bourne Supremacy, we were able to fully appreciate a city house exploding with color-accurate orange flame licking up into life-like green shrubs. While obtaining realistic color rendition from the KLV-S23A10 is a no-brainer, getting the display to reproduce accurate blacks was a challenge. A car-chase scene where a black SUV spread though a dark tunnel in The Bourne Supremacy pushed the KLV-S23A10 to its limits. At the standard image setting the sequence of dark scenes lacked detail. Cranking up the brightness or putting the display into pro mode brought out more detail, but cost the image its dark blacks. To help eliminated washed-out blacks you can turn on the "BlackCorrector" feature, but, just like turning down the brightness, it costs you picture detail. Like all LCD-TV owners, owners of the KLV-S23A10 will have to decide between jet-black blacks or subtle detail in their picture. The car chase scene also would've allowed for a test of Sony's CineMotion, which applies a reverse 3:2 pull-down where appropriate and improves fast-action scenes, had our DVD player not handled this process for us. The only visible artifacts or "image slurring" related to LCD response time were the result of fast scrolling credit text on a black background (but this was more likely attributable to the broadcast feed they were arriving on). This display has a response rate time of 12 milliseconds, comparable to high end products from Sharp and half that of some cheaper 2nd and 3rd tier manufactured products. This response time allows for almost no perceptible motion lag from fast-moving images. 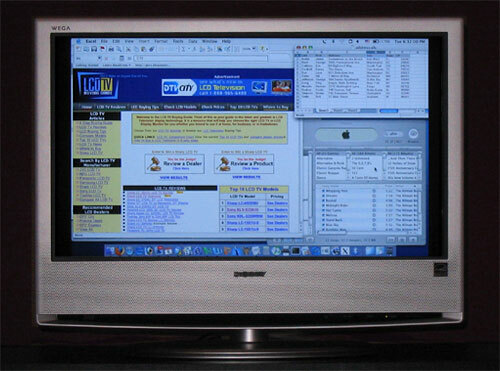 The KLV-S23A10 renders text and the on-screen graphics with incredible clarity when used as a computer monitor. Sony's history as a computer chip manufacturer shows through in all areas of use as a monitor. As LCD Televisions go, the Sony KLV-S23A10's picture clarity, brightness, and viewing angle stand out. The 23-inch display's 1,366 x 768 resolution displays HDTV beautifully and provides those using the display with a computer a large working desktop. Testing the display with a computer we found that the screen's pixel size was a little to large to be used up close as a primary monitor and too small to be used for presentations to larger groups. Still, laptop owners looking for a second or dual-display setup might enjoy using the KLV-S23A10 as an additional monitor to expand their desktop while not on the road. The backlight feature, which can be adjusted on a scale of 0-10, is bright enough to be clearly seen in a well-lit room. The range of backlight adjustment is very narrow and viewers in moderately dim rooms might want to prolong the display's life by putting the TV into the power-save mode, which keeps the screen visible but further dimmed. A second power-save mode, which turns off the display, allows users to listen to cable or satellite music channels through the TV without consuming the bulbs life. Sony doesn't provide estimates for bulb life, but we would expect it to be on par with other LCDs running 30,000 - 60,000 hours. You can view the Sony KLV-32A10's from almost any angle. A tilt and swivel stand gives users further latitude in viewing the screen from their desired location. The stand's 3-degree forward and 15 backward tilts and 15 degree swivel to the left or right also gives many more options when placing the display on a desk. Picture clarity is well-maintained, as is color, throughout a 170-degree range in front of the display. If a the majority of viewing will be substantially off-center and only a small fraction of viewing will take place in the center 30 degrees, activating the vivid picture setting helps maintain colors better at the far reaches of the viewing angle. The 23" TV is best viewed within 10 feet of the screen. Sony's LCD Television places access to the aspect ratio controls under the wide button on the remote. 4:3 video sources can be displayed in zoom, wide zoom, normal, and full modes; 16:9 High definition sources have the 4:3 options minus the normal setting. Using the standard aspect ratio setting to display a 4:3 source on this high-resolution display resulted in huge bars surrounding the image, full stretched the image visibly wide, zoom was naggingly tall, and wide-zoom, though it cropped a tiny bit off the top and bottom of the image, was ideal for our DVD tests. Full mode avoided unnecessary stretching and preserved the image integrity with minimal, if any, boxing while watching a 1080i broadcast feed. The Sony KLV-23A10 LCD Television's features compliment its picture quality. Strong sound reproduction, clean packaging, a well-designed remote control, and clear menus make using the device a pleasure. There is a way to connect just about any device to the LCD TV thanks to the included HDMI, VGA, coaxial, composite video, and component video jacks. A clean installation of the TV is easy using a cable corral that concentrates cables behind the tilt-and-swivel base's trunk. To get the power cord and coaxial cable into the corral requires some serpentine routing, but once behind the trunk viewers have a very clean looking space between the display's bottom mounted speakers and their mounting surface. With its stand intact the display is just under 24-inches tall, 18 inches wide, and 8 ¾ inches deep. This display is no lightweight weighing in at 27 lbs. with the 8 lb. stand attached. Sony includes a support belt that can be used to keep the TV from toppling over on a table or stand. Sony's manual provides all sorts of useful installation do's and don'ts with illustrations. My particular favorite was a graphic instructing users not to place their new TV on a couch along with their toddler. While the legal department's involvement on the manual design might have been a little over the top, users will appreciate that separate manuals are included for English, Spanish, and French. Some other manufacturer's bulky instruction manuals, including every language from Albanian to Zulu, are useful for learning Portuguese travel phrases to tell overly-helpful porters grabbing at your bags on your next trip to Rio: "servicing the unit may result in injury and/or death you assume full liability for any and all injuries you sustain." With Sony's guide, anglophones, francophones, and Spanish speakers will have clear, compact instructions on how to use their TV. For those in a hurry, a quick-setup page is also included separately from the manual. This LCD display has only one set of RCA-type component inputs and two sets of composite inputs (where either S-Video or RCA can be used). However it does include an HDMI input for HD cable and satellite box input, as well as a rare VGA 15 pin input for computer use. While the image quality isn't markedly poorer using composite RCA than component RCA, we observed slightly better skin tones and of course better black levels when viewing the same DVD source over component than composite connections. Sony includes WEGA GATE on the LCD- KLV-S23A10 as an "added convenience... which with a push of a button enables you to perform a variety of tasks intuitively on a simple control panel." Cut through the buzz and you'll find out that WEGA GATE is nothing more than an on-screen menu - not the invention of the millennium. I personally found the WEGA GATE to be an inconvenience since pushing the "menu" button on the included remote control does nothing to the TV. After becoming frustrated by the menu button I decided to push the WEGA GATE button. With bold text and a colored box surrounding the WEGA GATE looks like it could launch the TV into space. Fortunately I ended up with an intuitive, aesthetically pleasing set of menus to control the display. Users can switch between inputs using the button labeled TV/VIDEO, a throwback to the days when VCRs were the new hot item. Today TV/VIDEO is a bit of a misnomer when computers and PlayStations are connected via VGA and HDMI cables. Sound out RCA jacks are provided and users can select to turn off the internal speakers entirely or enable TruSurround, one of many pseudo-surround technologies that attempt to emulate the surround experience with only two speakers. There is also a SteadySound option to keep loud commercials in check. Sony puts its freeze frame controls at the top of the remote. In its manual, Sony says the freeze frame button is useful for capturing on-screen phone numbers and recipes. Given that logic it makes sense to have the button handy on the remote and Sony gets kudos for this foresight. The LCD Television, which is assembled in Japan, consumes a modest 110 watts of power with the display on, and less than 1 watt with the display off. Sony thoughtfully includes a well-made Coaxial cable and black colored VGA cable. The Sony KLV-S23A10 LCD TV sells for around $1400 is a display that should not be overlooked. A shopper will not find a better product in a 23" LCD TV/Monitor. This LCD display is feature and quality laden. It definitely appeals to the top end user that wants long lasting Sony performance and is not looking for a 2nd or 3rd tier manufactured product.